Can Under Armour Inc Shareholders Find a Blueprint in Nike Inc? The gradual shift from torrid growth stock to stable dividend payer at Nike could be a sign of things to come for Under Armour shareholders. 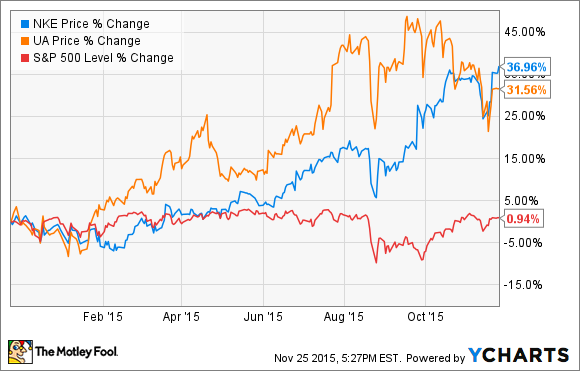 Nike(NYSE:NKE) has been the best-performing Dow stock so far in 2015. It continues to put up growth numbers that would be the envy of much smaller businesses and has many early opportunities -- China, basketball, and fitness technology to name a few -- that should continue to push the stock higher. In many ways, athletic apparel retail has become a two-player game between Nike and Under Armour (NYSE:UAA). I own shares in both companies and think they'll both be big winners over the long-term. In fact, Nike's past five to 10 years and new capital allocation plan make me even more excited for my future as an Under Armour shareholder. Of course, Nike is on a different part of the growth curve compared to Under Armour. The former clocks in with a market cap greater than $110 billion, while its upstart competitor is around $20 billion. The difference necessitates different investor expectations for future growth, as Nike's forward price-to-earnings is less than half that of Under Armour's. It's important to keep in mind that the same could have been said about the two companies a year ago. Since then, they have delivered very similar stock performances. Simply being a more mature, more highly capitalized company doesn't mean Nike will either outperform or lag behind its younger competitor. It does, however, require the company to access some tools from its financial toolkit. Nike recently announced a new $12 billion share repurchase program, a 14% increase in the quarterly dividend, and a 2-for-1 stock split. The split is purely for cosmetic reasons, but the buybacks and the increased dividend have a material impact on shareholder wealth. Nike has a dividend payout ratio under 30% and can easily afford to raise its dividend. While the yield looks low at just under 1%, this is still a great long-term dividend stock. In the past five years, the dividend has doubled from $0.16 per quarter to the recently announced $0.32 quarterly payout. To go along with that increase, the stock price itself has nearly tripled. The effective yield for an investor who bought five years ago is much higher than the published yield today. I expect the same to be true for investors who buy now and check their statements again in half a decade. Nike is expecting to complete its latest share repurchase agreement of $8 billion before the end of fiscal year 2016. Management then will have authorization to buy back up to $12 billion in stock over four years. Buybacks are like any other equity investment. If a company buys its own shares when they're cheap, it's a good use of resources. I expect management to continue to make prudent decisions in this area over the coming years. With the stock price trading right near all-time highs, the previous $8 billion has surely been accretive to shareholder wealth. What does this mean for Under Armour? It's easy for investors, even of the long-term variety, to think of companies only in their current stage of the life cycle. "This is a small biotech, so I'm expecting risky growth with money poured back into R&D," or "This is a large multinational that produces an entire supermarket aisle worth of processed foods. An investment here will probably offer a nice yield and some safety but little in the way of growth." I like to think about how a younger company will evolve over a five, 10, or even 20-year period. McDonald's was once the hottest growing restaurant investment around. Now, it pays a 3% dividend and fits a very different profile from what it did three or four decades ago. There are many reasons this point is important -- tax benefits and a long-term focus to name a few -- but mainly, it comes down to the fact that the truly great companies are really hard to find. If one invests in a great young business that grows 10, 20, or 100 times larger over the years, does it really make sense to cut bait? It can be difficult to imagine how a small biotech can morph into a Gilead Sciences or Celgene, or what Netflix will look like when it has saturated the world with its streaming services and is gushing cash. Fortunately for Under Armour shareholders, we have a portal into the future with Nike. Under Armour is investing aggressively into sponsorships with college athletic programs, MVPs, and the next big thing in golf. The company expanding its line of offerings to include casual wear and improvements in all of its sports gear. It still has a long way to go before it considers returning capital to shareholders, but that day will come. For long-term investors, some of the best dividend stocks might be ones that don't even pay one currently. Under Armour is one of these businesses. At some point, the growth opportunities will dry up and/or the cash flows will be too abundant to not pay a dividend, buy back shares, or both. If the share price appreciates 10 times over the next 20 years, a 1% yield will effectively be a 10% yield on cost for those buying shares today. That's the true power of time and compound interest. I recommend looking to add some shares of these two compounding machines to your portfolio to build wealth for the long run.